One day, pharmaceutical companies might not have to test new drugs on animals or even humans. Instead, drugs could be tested with organ-on-a-chip technologies. These are not silicon chips that simulate organs or organisms, mind you; they contain real living, human tissue. The Wyss Institute for Biologically Inspired Engineering at Harvard University is going even further with its organ-on-a-chip research by linking up 10 of these individual chips to simulate the entire human body. 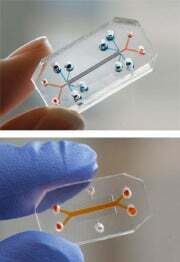 These organ chips are made with a silicon polymer with microfluidic channels carved into them. The channels are filled with human cells, as well as pumps and other mechanical elements that move the cells to replicate the movement of the actual organs. The lung-on-a-chip, for instance, contains an air sac, a layer of lung cells, a separating membrane, and a blood channel that contains red blood cells. The chip can be connected to a vacuum pump that expands and contracts the organ like the real thing. The Wyss scientists also produced a gut-on-a-chip that contains intestinal cells that writhe like a human gut going through the motions of peristalsis (pushing food though). 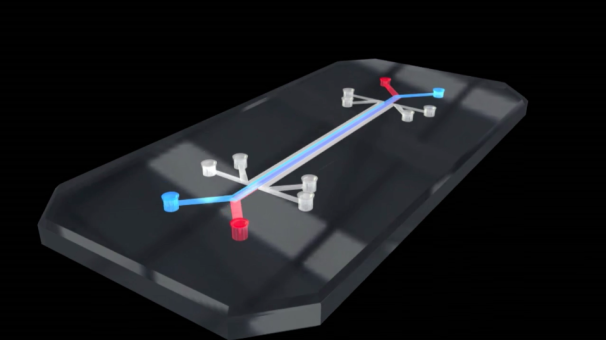 The idea is to replicate the function and composition of an organ on a chip that can be easily tested in order to study effects of diseases, toxins, and pharmaceuticals. The system could provide faster and more accurate human drug testing results than the slower, inaccurate process provided by animal testing. The Wyss Institute recently announced it has entered into a $37-million cooperative agreement with DARPA to create a system that integrates 10 organ-chips to create a complete human-on-a-chip system. The researchers are already well onto their way in develop a chip that mimics the heart, bone marrow, and the human kidneys. With a complete human imitating system, scientists could see the biochemical effects of drugs across the entire human body.